An evening pause: The music is Paper Tigers by Javier Dunn. Because I live in southern Arizona, I take advantage of this location to make an annual trip to the Grand Canyon. On my previous trips I’ve talked about the right way to hike the canyon (slowly!) and then provided some suggestions for proper preparation. This time I am simply going to suggest two hikes. One is very easy and should be done by every visitor to the south rim. The other hike is for those who go to the bottom, and reserve themselves one day there for a day hike. An evening pause: I prefer to do it a bit slower, but this will give the couch potatoes here a sense of why I and others like to go hiking. Some of these are not that unbelievable, but numbers 4 and 9 are really cool. And number 1 was already reported here on BtB. The one thing about the Grand Canyon that attracts hikers is its intimidating nature. People feel challenged by its large size and depth, and want to prove to themselves that they can do it. The irony of this to me is that it is that intimidating nature that generally causes most people the most problems. People worry about the climb out. They worry about the heat. They worry about the lack of water. And they worry about vastness around them. All of these things — the climb, the heat, the lack of water, and the vastness — must be dealt with. Each has caused the death of many visitors. Each could kill you if you are not prepared. In fact, one or all of these factors are probably the primary causes behind all of the approximately 300 rescues that occur each year at the Grand Canyon. Yet, none of these factors is actually the biggest obstacle for most people trying to climb in and out of the Canyon. Instead, it is the worry about these things that causes people the most difficulties. 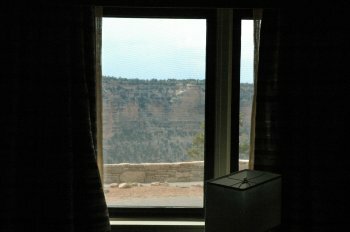 After a 5.5 hour drive we arrived at the south rim of the Grand Canyon and checked into our hotel. You can see the view from the window on the right. Not very spectacular, but then, you don’t spend much time in a hotel room on trips like this. Tomorrow we take the shuttle bus to the North Rim, where will spend another night in the lodge there. On Saturday, we hike down on North Bright Angel trail, and will stay in a cabin at Phantom Ranch for the next three nights, doing day hikes from the bottom of the canyon on Sunday and Monday. We will hike then up on Tuesday, coming up Bright Angel trail to the south rim, completing our first rim to rim hike. Once we check out of our hotel tomorrow, we will be out of contact with the internet until we return to the south rim. I hope the world doesn’t fall apart in the interim. This will be Diane’s third trip to the bottom, and my fifth. I can’t express how happy I am to be back. This is truly one of the grandest spots on Earth. The awesomeness of camping and hiking, in pictures. Want to go hiking? You can now hike some of the country’s best trail, from the comfort of your home! Want to go hiking? You can now hike some of the country’s best trails, from the comfort of your home! An evening pause: Taking a walk through the Wave in the Paria Vanyon Vermillion Cliffs Wilderness Area, Arizona. An evening pause: A hike to Romero Pools in the Santa Catalina Mountains just outside Tucson, Arizona. The hiker in the video calls this one of the toughest hikes he’s ever done, but it is only 5.6 miles round trip, with only a thousand foot elevation gain. Compared to most of the other Santa Catalina hikes, which routinely require elevation gains of 3000 to 5000 feet, this one is easy. An evening pause: Hiking Pu’u Kalena, the second highest peak on the island of Oahu, Hawaii. An evening pause: The rope work makes me cringe and some of the narration is a bit over the top, but the camerawork is superb, giving you a real feel of what it is like to visit this unique place. An evening pause: This video doesn’t quite get you to the top, but it definitely gives you a feel for the spectacular nature of the hike. An evening pause: With the approach of winter, let’s do an overnight trip in the snow! An evening pause: The stairway to heaven, in Hawaii. An evening pause: How about some more hiking on the edge of the world? This is the Knife’s Edge trail on Mount Katahdin, Baxter State Park, Maine.